Altitude range: It dwells at elevations between 50 and1,000 metres above sea level. Habitat and Ecology: The species occurs in coastal hills (lomas costeras) on rocky soils, exposed, but with protection from direct sun through coastal fog (camanchaca).The plants obtain water mainly from condensation. The species is frequent and overall the population is stable. 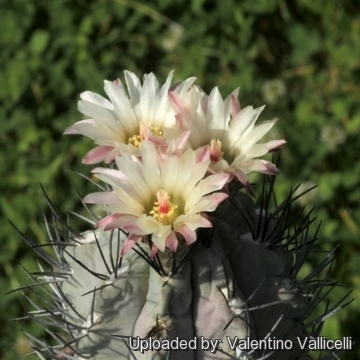 Description: Eriosyce taltalensis subs. paucicostata is a very variable species for size and number of spines, colour of epidermis, number and form of ribs, etc. It comprises several questionable varieties and its taxonomic history has undergone several changes. The great variability of Eriosyce paucicostata is due to the fact that cross pollination among different forms and different species (in habitat and especially in collections) is very frequent and it can be quite difficult to determine what is the "pure type" and the cross. The form "viridis" is distinguishable for the grass green body (whereas the standard form generally has grey-blue-green often grey-purple tinged stem), but even the “viridis” plants tend to take some purple in strong light during colder months or under stress conditions, and the differences among individuals may be remarkable. It can happen that two individuals of two different populations can look very similar and also, two plants of the same population can look very different. Stem: Solitary, later columnar ca. 6-8 cm in diameter and 15-30cm long and then half recumbent, strikingly grey-blue-green often grey-purple tinged , with barely developed or virtually absent tap root with abundant white wool on top. Ribs: Adult specimens have only 8-12 ribs very pronounced, even in young plants, later to nearly 2cm high, fairly acute, at the base much broader, with very small cross grooves above the sunken areoles, but a strong chin under the areoles. Spines: Juvenile specimens have 1 central spine and 8 radials, but the numbers increase as they get older, and areoles can have over 20 spines on mature specimens. Central spines: Dark brown to black, soon becoming chalky-white or greyish, up to 20 mm long. Radial spines: 6-12, up to 1 cm long. Flowers: From young areoles, campanulate or funnel-shaped, very pale pink, cream-white or pale yellowish with a vague green nuance (rarely reddish). About 3-5cm long, opening 3-5cm broad, scentless. Floral tube with abundant white wool and bristles. Ovary; green to brownish, with white flecks of wool in the axils of the very small brownish scales. Flower Tube; tubular up to the nectar chamber, above that funnel shaped to bell shaped, 1.4-2.2cm long, opening to 1.3-1.7cm broad, on the outside like the ovary, with however in the axils a single stiff brown or black bristly spine, interior practically white. Nectar Chamber; 2.25-4mm long, 3-4mm broad, half open. Stamens; white, more or less tinged green, the lowermost 0.75-1cm long, the uppermost 1-1.5 cm long; anthers small, pale citron-colour, extending not altogether as far as halfway up the flower. Style; carmine colour, 2.2-2.4cm long, 1.5mm thick, with 8-10 cream coloured 3mm long stigma lobes, that approximately equal the anthers or slightly exceed these. Petals; 1.7-2cm long, 3-5mm broad, shorter or longer the innermost white, the outermost more pink, with white margin. 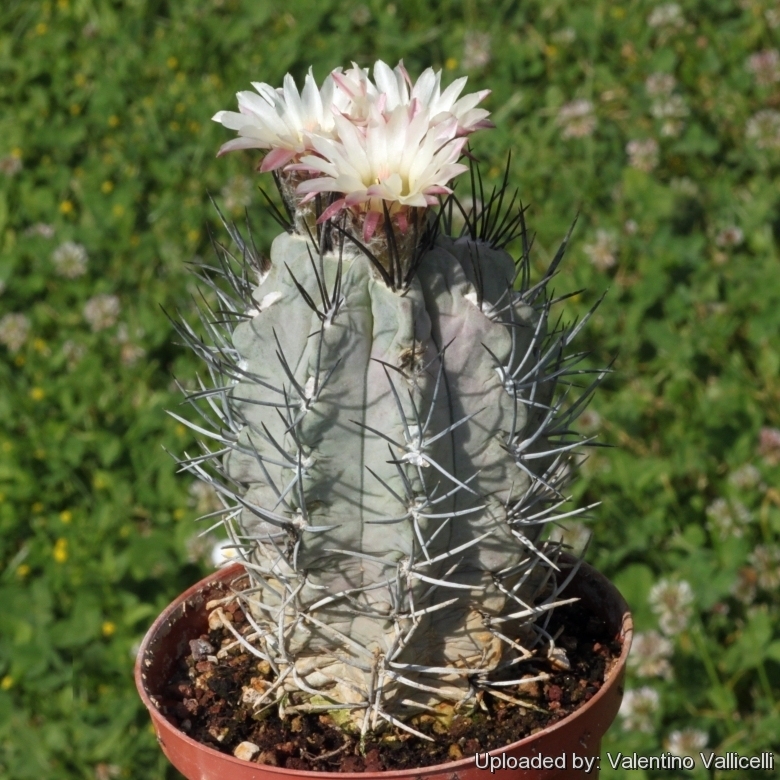 There might be over 50 flowers on a mature specimen (only mature specimens bloom). Fruit: Reddish, elongate, opening by a basal pore. 4) David Hunt "Succulent Plant Research" Volume 1, Richmond page 1994. 7) Faundez, L., Guerrero, P., Saldivia, P. & Walter, H.E. 2013. Eriosyce paucicostata. In: IUCN 2013. "IUCN Red List of Threatened Species." Version 2013.2. <www.iucnredlist.org>. Downloaded on 07 June 2014. Cultivation and Propagation: Eriosyce taltalensis subs. paucicostata is a slow growing but relatively easy to grow species, providing they are kept dry during autumn and winter and rot prone if kept in a non ventilated place.